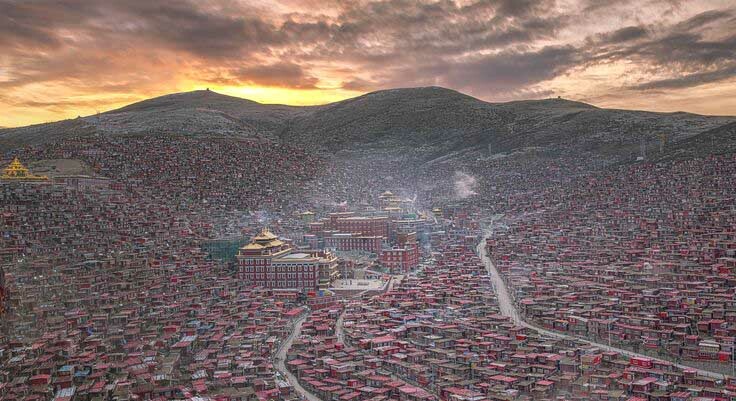 (TibetanReview.net, Mar25, 2017) – The Chinese government’s plan to drastically downsize the size of the students and the residential sprawl at the globally famed Larung Gar Tibetan Buddhist academy in Serta (Chinese: Seda) County of Sichuan Province is nearing completion with 4,828 monks and nuns having been expelled since Jul 2016 and about 250 more under orders to leave by Mar 27, reported the Tibetan Service of Radio Free Asia (Washington) Mar 23. It was not clear how many residences of monks and nuns had been demolished thus far. The senior abbot has only said that after months of destruction by Chinese work crews of monastic dwellings at Larung Gar, about 2,000 homes still remained to be torn down. He has added that this work will begin on Mar 24.